The boats built in Italy, in other Mediterranean countries as well as those built in Great Britain and in Germany according to the Mediterranean tradition or that will be used in the Med Sea are ever-more similar to each other and are almost always of the same classes. This missing design diversification originates from the fact that smaller and weaker yards do not risk in building yachts that are too futuristic or too far from the traditional design. This attitude is accepted by brokers and by the less informed clientele who are afraid of making the wrong choices and of seeing the quotation of their used boat drop considerably. They do not "dare", if "dare" means choosing what one really likes and not what is more appropriate. Some time ago, I visited a Technema 87 and I was astonished by the extremely interesting personality of her design. 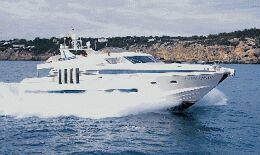 The boat size is considerable (91'5" ft) and she is a "wide body", that is to say, she has no side decks therefore, the salon is extended from one ship side to ship side. Traditionalists argue that this may pose a problem when docking, in fact, crew members have greater difficulties in running from bow to stern and vice versa. 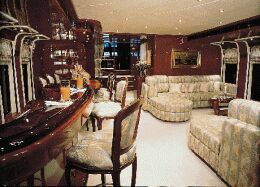 Nevertheless, I believe that worse technical compromises are often accepted on board a yacht and this choice greatly improves life on board and greatly satisfies the Owner who benefits from a salon which is as large as the salon of a 115 footer. After all, it is the Owner who pays and giving him great satisfaction means reaching an important objective. In reality, difficult docking is the declared criticism that hides reality: the average owner generally prefers a yacht with covered and artificially lit side decks because this arrangement gives the impression the boat is larger that what she actually is. On the contrary, the Technema 87, looks like a sport boat and when one leaves the flybridge to walk on the bow, the ompression of being on the deck of a very big open boat is invaluable. I like the "full breadth" concept very much. Nevertheless, in my opinion, if applied to boats that are smaller than 80 feet it would be a big mistake: the boat would look very high, not proportionate and relatively heavy (as related to her length). The Italian market does offer boats of this type but they are nothing special. Americans are traditionalist yachtsmen: they do not like innovations but they are very practical and love comfort and rationality. They adopted the "full breadth" formula years ago because they prefer ample interior space even if this means reducing space on deck. 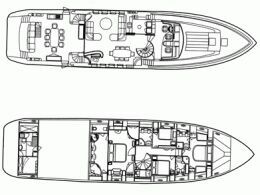 Tachnema 87 may be defined as a yacht with an international design and a strong personality with special aesthetic particulars, such as the big vertical window bays of the salon (at sea, the effect is fantastic). The interiors are in wood and are superbly finished. Everything seems to have been custom made, and not mass-produced, on this impressive yacht. The Tachnema 87 has a rather long deck aft which does not harm her outside line; on the contrary, the boat seems sportier that she is in reality. What really do not look nice are the reinforcing structures of the flybridge, which might need to be rather large due to the heavy tender chosen by the Owner. The Tachnema hull length does increase the L/B (length/beam) ratio but this value lies within the average value of other planing and semi-planing boats of the same class if one considers the speeds in the 20-30 knots range. For information, contact: POSILLIPO-RIZZARDI CANTIERI - Via Ammiraglio Bergamini 134, 04017 SAN FELICE CIRCEO (Latina, Italy), Tel. and Fax +39-773-547221.